Sikh Shooting Ties Into DHS ‘Veterans as Terrorists’ Narrative | The Daily Cheese. 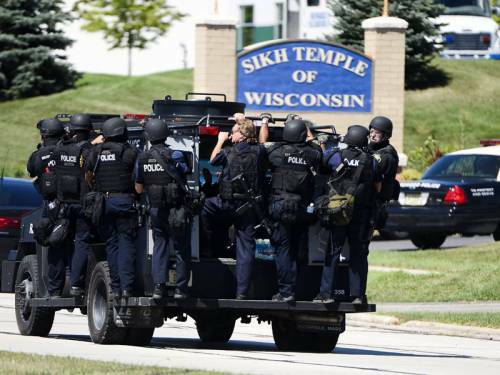 The tragic shooting at a Sikh temple in Wisconsin, which is now being treated as an act of domestic terrorism by the federal government, is set to be blamed on a US Army veteran, fitting perfectly the narrative pushed by the Department of Homeland Security that veterans are a terror threat on a par with Islamic extremists. “The gunman who shot six people to death and wounded three others during a rampage at a Sikh temple in a Milwaukee suburb was an Army veteran who may have been a white supremacist, according to a law enforcement source involved in the investigation,” reports CNN. And, the Ft Hood was not an act of terrorism…..strange happenings in our world. The speed of which these incidents are happening is increasing.I don’t think it is down to a change in society more likely inline with changes of government policy. To attack a Sikh Temple is a blatant attempt to ramp this stuff up. Sikhs offer no threat to anyone or anything. I agree with Cheese.